Connect via text 617 681 8899 and well share how to walk or ride to the Hotel via 24hr shuttle. 100 PCT NON SMOKING HOTEL. As a AAA Four Diamond hotel just two miles from downtown Hilton Boston Logan Airport keeps you connected to it all. Experience the convenience of being in your guest room in minutes whether walking via directly connected climate-controlled walkways or 24-hour courtesy bus service. Our courtesy bus also offers service to the subway car rental facility and water taxi. Please text or call 617-681-8899 to request a ride. 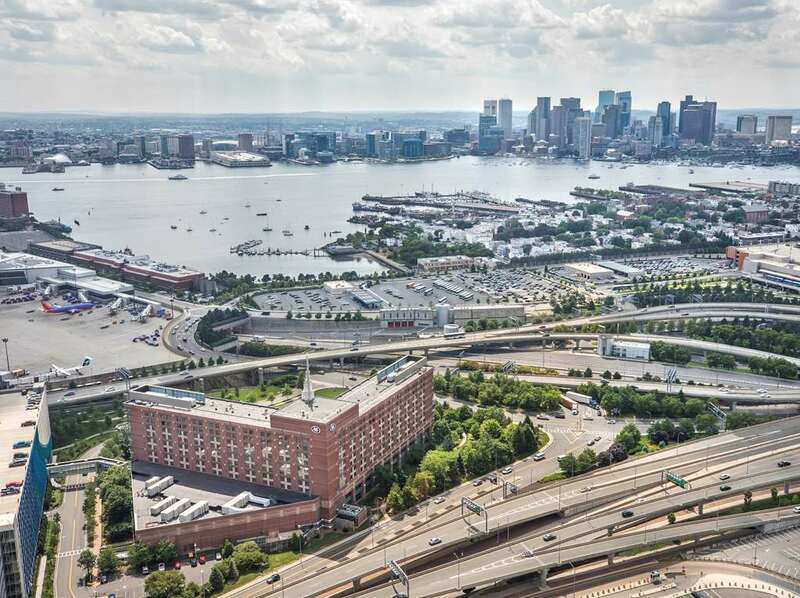 Close to downtown Boston our airport hotel is just 10 minutes from key destinations such as the Boston Convention - Exhibition Center and Seaport World Trade Center. Located in a park-like setting guests can enjoy a unique vantage point of the Boston city skyline or aeronautical views from our well-appointed guest rooms. Each of our relaxing guest rooms feature triple-pane windows and lush bedding for a restful night*s stay. From hearty breakfasts to light bites our hotel provides innovative dishes prepared with the freshest ingredients. Looking for a pick-me-up. Cafe Presto offers Starbucks coffee freshly-baked pastries and a variety of to-go options during the day as well as evening beer and wine options while Connolly*s Publik House believes in quality food and drink in a relaxed atmosphere. Find an array of excellent amenities you require for an enjoyable stay such as a modern 24-hour Fitness Center. outdoor running and walking paths. connectivity stations in our lobby. and a fully stocked gift shop for any last-minute souvenirs or travel essentials. 30 000 square feet of contiguous space is located on one level to provide an optimal function space for meetings and events of all sizes. Rest easy knowing our expert tenured staff provide a high degree of hospitality for both your business and leisure needs accommodating groups from 6 to 600 people. Berkshires: Join us for the best the day has to offer in our comfortable and contemporary restaurant Berkshires. Each morning we feature Breakfast at Hilton which offers a variety of items that allow you to focus on the low fat - low calorie hi-energy high fiber low cholesterol or indulgence life-style you desire.